And — at the end because nothing could follow it — Louis, explicated by our very own Ricky Riccardi here. Who knew that the state of yearning, of wanting a complete love and not yet attaining it, could be the source of such healing music? The song and performance that so enthralls me is from their last record date in September 1931 — DO YOU BELIEVE IN LOVE AT SIGHT? — composed by Ted Fio Rito and Gus Kahn. I am assuming that it was originally meant as a love ballad, given its title and world-view, but the band takes it at a romping tempo. (Was it played on one of their “coast to coast radio presentations”? I hope so.) Several other marvelous features of this recording have not worn thin: the gorgeous melody statement by Doc Cheatham; the incredible hot chorus by Rex Stewart; the charming vocal by Quentin Jackson; the tenor saxophone solo by Prince Robinson, the arrangement by Benny Carter, and the wondrous sound of the band as a whole — swinging without a letup. I love Doc Cheatham’s high, plaintive sound, somewhat in the style of his predecessor, Joe Smith — and how the first chorus builds architecturally: strong ensemble introduction, trumpet with rhythm only (let no one tell you that tuba / guitar doesn’t work as a pairing), then the Carter-led sax section — imagine a section with Carter, Hilton Jefferson, and Prince Robinson — merging with the brass. By the end of the first chorus, you know this is A BAND. (I’m always amused by the ending of the chorus, which exactly mimics the end and tag of THERE’LL BE SOME CHANGES MADE. Nothing new under the sun.) And whose idea — Carter’s? — was it to so neatly use orchestra bells throughout this chart? Lemon zest to the ear. Then a gloriously “old-fashioned” vocal from Quentin Jackson, but one that no one should deride. He told Stanley Dance that he learned to sing before there were microphones, so that you had to open your mouth and sing — which he does so splendidly here. He’s no Bing or Columbo, wooing the microphone: this is tenor singing in the grand tradition, projecting every word and note to the back of the room. The final chorus balances brass shouts and the roiling, tumbling Prince Robinson, who cuts his own way amidst Hawkins and Cecil Scott and two dozen others: an ebullient, forceful style. And by this chorus, I always find myself rocking along with the recording — yes, so “antiquated,” with tuba prominent, but what a gratifying ensemble. Yes, I believe! It is structurally the same, with the only substantial difference that Rex continues to play a rather forceful obbligato to Quentin’s vocal — almost competing for space, and I suspect that the recording director at Camden might have suggested (or insisted on) another take where the vocalist was not being interfered with. How marvelous that two takes exist, and that they were recorded in Victor’s studios in Camden — a converted church with fine open acoustics. There is a third version of this song, recorded in 1996 by Doc Cheatham and Nicholas Payton — sixty-five years later, but for me it is a descent from the heights. You can find it on YouTube on your own. 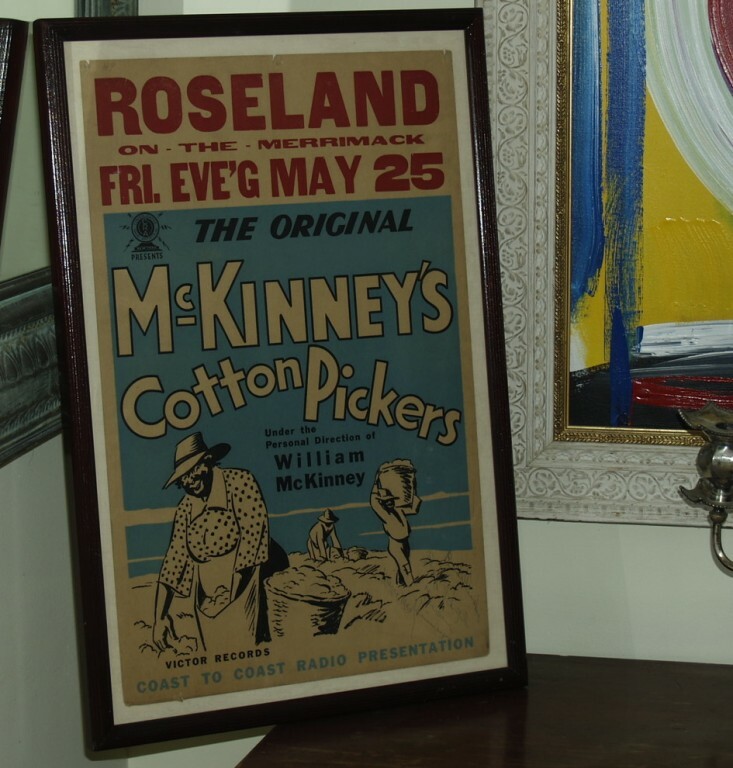 Whether or not you believe in love at sight (that’s a philosophical / emotional / practical discussion too large for JAZZ LIVES) I encourage you to believe in the singular blending of hot and sweet, of solo and ensemble, that is McKinney’s Cotton Pickers. One has to believe in something. And in a few seconds more than three minutes — the length of a 78 — she makes us all feel more optimistic. Janice can affect us in many ways, but at her core is a gentle winsomeness, which comes through so easily here. “Why not grin?” indeed. We have Janice Day and Her Gang to inspire us. And this November, there will be another Party — celebrating a quarter-century of the best hot music, November 6-8, 2015. That cheerful recording will seem an odd introduction to my topic, which is Death. I think about that subject a great deal — not in a terrified way — because I am surrounded by reminders of those dear ones who have moved on (or away) and the Things that people leave behind. When I go to an estate sale and I learn that the beautiful shirt I am wearing belonged to a man who is now dead, it is a spiritual lesson — intense and to the point. When I go to Amoeba Music or the Down Home Music Store and find a dozen records all autographed to the same person — let us call him Dewey — I can safely guess that Dewey is no longer here, listening to those discs. I feel grateful to be the recipient of objects that people cherished so when they were alive, yet sad that they are no longer here to enjoy them, and of course it makes me think of the finite shape of our lives. So let us assume you have — as many jazz-lovers have — amassed a hoard, large or small, of objects related to the music you love. Maybe they are records (cylinder to CD), autographs, photographs, ephemera (DOWN BEAT from 1939, a necktie that once belonged to _____): there are a thousand possibilities. I understand this. It is very difficult for some of us to imagine the universe without us. But it will happen. In my most kind voice, may I suggest that this pretending it will not happen is not wise. When the jazz collector dies, if (s)he dies without a will, the collection and all the deceased’s possessions have to be appraised — which costs money — before an item can be given away, disposed of, sold. This process isn’t quick, and establishing the value of anyone’s things — unless the dead person was a true minimalist — takes time and costs money. If you have a partner or children, do you wish to add to their grief the burden of this legal and economic maze? Or, if you have no one close to you, what will happen to your precious collection of deep-groove blue label Riversides? My guess is that the landlord will haul them out to the curb or perhaps sell them to the local record store (not the worst thing). Of late, I am observing the partners of several friends who did not write wills, and their troubles are truly painful. I am not talking about, “My goodness, I hear that all of Joe’s Paramounts went to Goodwill! It was horrific!” I am talking about the bereaved partner who not only has to deal with loss, but has to deal with The Stuff. It is all too easy to say, “Oh, I think it should all go to this jazz institution or the other. They will want my Harry James and Benny Goodman 78s.” Don’t be too sure. Libraries and institutions do not have infinitely expanding budgets, and to collect your beloved records, catalog them, store them in the proper fashion . . . all of this requires money and a staff. Be sure to be sure — before saying, “I’d like my collection to go to ______,” that they really want it and will want it in some time in the future. All this will sound too grim to some readers, and I apologize. It was not easy for me to write a will, nor is it pleasant dinner conversation to discuss such things with the Beloved. And I’m not just writing this to jazz collectors. Please pass this blogpost on to anyone you know who has more than a few of Anything — whether it’s copies of MARTHA STEWART LIVING in MSL binders or first editions or swizzle sticks. Please do consider this yourself, though, and act on it, promptly. I write these paternalistic nagging words with love. Posted in Awful Sad, It's All True, Jazz Worth Reading, Pay Attention! Yes, I know it’s about five weeks early. But Emrah has provided us with a double delight — a great romantic ballad in swingtime, beautifully sung by Quentin Jackson, with solos by Doc Cheatham, Rex Stewart, and Benny Carter . . . as well as a Carter reed-section passage and rollicking piano accompaniment from Todd Rhodes. The delights of this performance are many, and they grow with repeated listenings. The supple, fluid sweetness of Doc Cheatham’s melody statement; the vigorous “I will play a note or two to every beat” solo chorus, so flavorful and personal, by Rex Stewart; the lusciously slippery Carter reeds; the dashing vocal chorus by Quentin Jackson (play this for everyone who insists that before Crosby, all male singers sounded insufficiently masculine), and the rocking motion of this ensemble, thanks to Wilborn, Taylor, and Austin, refuting another canard, that jazz musicians were waiting to get rid of banjo and brass bass so that Modernity could burst forth. Happy Valentine’s Day, all you lovers. Start your romantic engines early. Work on becoming just as swoony and loving as the men and women portrayed on Emrah’s photographs and postcards.